The PennDOT team is hard at work to make Pennsylvania REAL ID-compliant, though many customers and employees may have questions. Can I use my Pennsylvania license to fly? Does the new driver license design mean it's REAL ID-compliant? What IS REAL ID anyway? Fortunately, we've got answers. And it's not as confusing as you think. First of all, you may recall an original deadline of January 22, 2018, for Pennsylvania to be compliant in order for our residents to board domestic flights. In fact, some Pennsylvania airports are still displaying signs warning flyers of that deadline. But don't worry — Pennsylvania has been granted an extension until October 10, 2018. That means you can continue to use your current Pennsylvania driver license or ID to board domestic flights and visit military bases or installations and federal facilities that require ID for entrance until at least that date. But, wait. PennDOT just changed the licenses last summer; wasn't that to make them REAL ID-compliant? No, those changes were in development for nearly two years before PennDOT was even legally allowed to work toward REAL ID compliance. The new license and ID design provides enhanced security features that improve fraud prevention and help protect from counterfeiting and alteration. Once REAL IDs are available, they will look exactly the same as the new license, except a compliant product will be marked with a gold star. So, why is it taking us so long to become compliant already? Well, PennDOT wasn't even allowed to start working toward compliance until May 2017, when Governor Tom Wolf signed Senate Bill 133, which repealed prior legislation that barred the governor or PennDOT from participating and authorized Pennsylvania to become compliant with REAL ID. PennDOT got to work immediately and expects to have compliant licenses and IDs available in spring 2019. Once available, you DO NOT have to get a REAL ID. In fact, if you don't plan on flying or visiting a federal facility or military base, you may not need one at all. If you do decide to upgrade to a REAL ID, but your current license or ID isn't expired yet, you'll pay a one-time fee of $30 and a renewal fee (which is currently $30.50 for a standard, non-commercial driver's license), but the expiration date on your new REAL ID-compliant product will include any time left on your current product, PLUS another four years. So, if your license is set to expire in October 2020, but you upgrade to a REAL ID in October 2019, your new REAL ID-compliant license won't expire until October 2024. If you've gotten your initial Pennsylvania license or ID since September 2003, it's possible that PennDOT already has your verified documents on file and you will not need to present them again. Most of PennDOT's customers, however, received their initial product BEFORE September 2003. 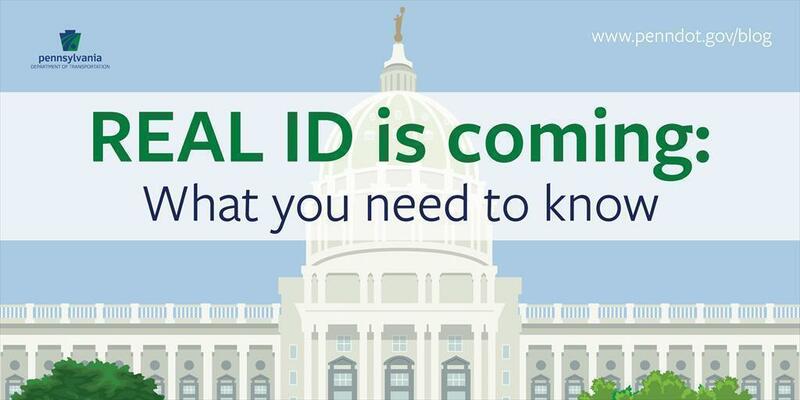 More questions and answers about REAL ID in Pennsylvania can be found at www.penndot.gov/REALID. Or you can call the driver and vehicle services call center at 717-412-5300.